Despite the fact that this is classic European peasant fare, modern cooks tend to avoid it because unless you have a chronic vampire problem, 40 cloves seems…excessive. Ah! But when cooked into the dish the result is a smooth, sweet, earthy flavor and an aroma that wraps the kitchen like a hug. Make sure you have bread on hand to spread the soft cloves onto and don’t forget to sop up that oil. Yes, all of it! Season the chicken all over with salt and pepper. Coat the chicken pieces on all sides with 2 tablespoons of the oil. In a 12-inch straight-sided oven-safe sauté pan over high heat, cook the chicken for 5 to 7 minutes per side, until nicely browned. 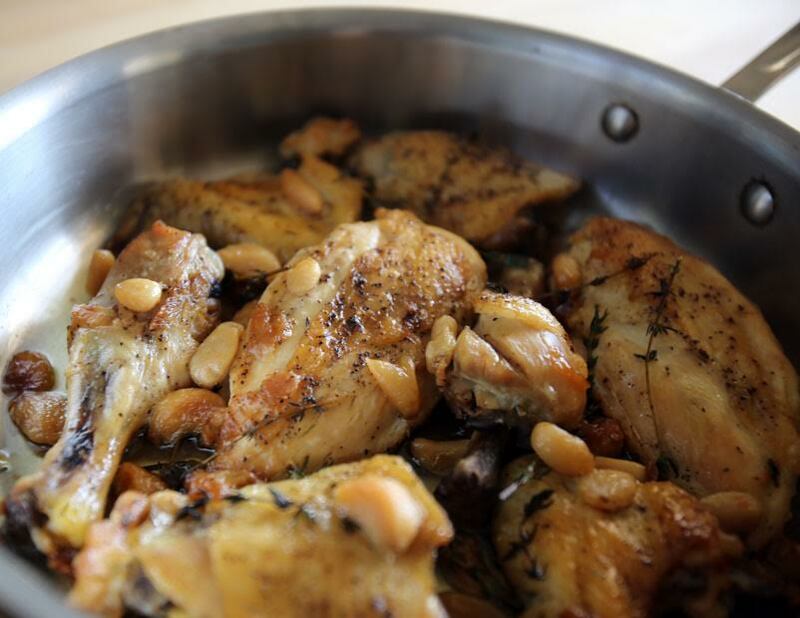 Remove the pan from the heat; add the remaining 1/2 cup oil, the thyme, and garlic cloves. Cover and bake for 1 1/2 hours. Remove the pan from the oven and set aside for 15 minutes with the lid on. Serve family style with plenty of toasted bread to spread the softened, fragrant garlic on. What the history of this dish, and why 40 not 30 or 50? I have a 10 inch cast iron skillet. Browning won’t be a problem. However I would like to use my crock pot. The setting is 4, 8, 10 and 12 hours. It does have a lid which can be made tighter with tin foil. So…can I use this and if so which setting and for how long? Thank you. Can I just pull off the ‘loose paper’ part of the garlic clove so I can squeeze out the garlic? I Love that…! I used my dutch oven and browned the chicken in 2 batches. I dobt have a saute pan with tight fitting lid, so I figured my Dutch oven was best. Also, I didnt have regular olive oil, does using extra virgin make that much of a difference? How long should I cook the chicken if I only have a oven dish? I don’t have a lid for the chicken and garlic? Is there a way to cook it on the stove top? I have a pan with a lid that is stove top safe. Please help. If I wanted to add potatoes to this dish, do you think I should add them for the whole 90 minutes? Or maybe put them in later? And should I add more fat to the dish when I put them in? This is a reply to Adam who commented that : “cooking time and temperature seem excessive.” Nothing could be further from the truth: Make sure you have a heavy Dutch oven with a tight fitting lid, or a heavy salute pan with a tight fitting lid. The lid must fit tightly. Covering with foil or anything else will not cut it. The dish will dry out and burn, this dish comes out perfectly in my Lodge 6 qt enameled Dutch oven with lid. Set it and forget it. 350 degrees at 90 minutes . Done it 20 times or more. Temp and cook time seems excessive. Chicken and garlic have burned and blackened to the pan side both times I’ve tried this, second time I moved up a rack in the oven. Whole bone in chicken both times, roughly 4.5 lbs. I wonder if the length is necessary for thighs without bones? Completely agree on the chicken thighs ! Dark meat shines in a long cooking dish such as this. This one is a winner. The chicken comes out deliciously succulent. And that roasted garlic spread onto toasted bread is no joke! How would I reconfigure this recipe for chicken thighs only (4 total)? Is there a vegetarian entree option that could work with this recipe? There is a lot of comments and I do not feel like searching to see if the same question has already been asked…can I use a different salt. I prefer sea or Himalayan salt. Salt is salt. Just make sure you adjust for the coarseness of it (eg. 1 pinch of superfine salt is more than 1 pinch of coarse sea salt). Tried this recipe with just chicken thighs. It was amazing. Miss Nat, chicken thighs are the way to go. They hold up well and become sublime using this recipe. Could not agree more. I can’t wait to try Alton’s version and also LOL at the girl who misunderstood the recipe and thinks she’s going to add cloves.. that should be different. Would a Dutch oven work? I don’t have a oven safe skillet with a lid. Absolutely it would, just make sure that the lid fits well, use regular olive oil, not extra virgin olive oil. On the olive oil, I am just passing on Alton’s notes from this recipe in one of his cookbooks which I possess. Follow the instructions exactly, no peeking at all. Run the entire time, the final results are worth it. Yes, but you get around that by Browning the chicken first in batches as per the recipe. No problem at all with a dutch oven, that’s what I use and what it is designed for. Actually, Erika, a dutch oven is perfect for this recipe, and many others. You get around this by following the recipe directions, browning the chicken in batches in the dutch oven on the stovetop, when finished browning, place all of the of ingredients in the dutch oven, close the lid , 350 degree oven for 1 1.5 hours. Perfect every time in a dutch oven. Browning in batches is Cooking 101.. This is my husband’s favorite recipe that I’ve pulled out for dinner. He’d shake your hand and possibly kiss you if the opportunity ever presented itself. I’m pretty sure if I’d made this on our first date he would’ve asked me to marry him immediately. Didn’t take him long anyway, but I should have done it. Obvious fact: the recipe says cloves in the title but they are not mentioned in the ingredients. umm what do we call a single piece of garlic, thats right now how many of those are used in the application?